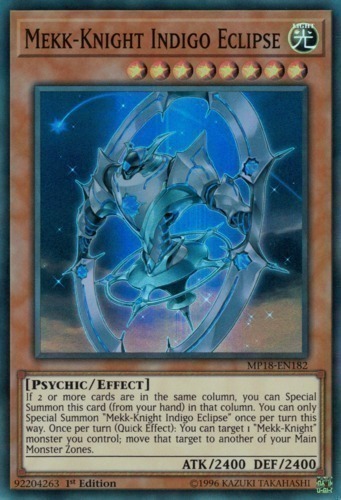 Text If 2 or more cards are in the same column, you can Special Summon this card (from your hand) in that column. You can only Special Summon "Mekk-Knight Indigo Eclipse" once per turn this way. Once per turn (Quick Effect): You can target 1 "Mekk-Knight" monster you control; move that target to another of your Main Monster Zones.